A few weeks ago, I received an e-mail from Bruce Crawford complimenting my review of the Ray Harryhausen DVD "Mysterious Island." The e-mail included a link to Mr. Crawford's website. After seeing just who had paid me a compliment, I was deeply honored. 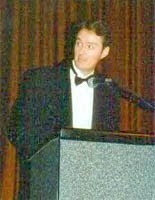 Bruce Crawford is a radio documentary producer, film historian, writer, board member of the "Halfway to Hollywood Film Festival," lecturer, and promoter. Mr. Crawford has been recognized by the American Film Institute for his work, including the promotion and preservation of classic films through his "Omaha Film Event" series. Mr. Crawford garnered national and international acclaim for his 2 and ½ hour radio documentary "Bernard Herrmann: A Celebration of his Life and Music." Herrmann, possibly the greatest composer, let alone film composer of the last century provided the scores for Alfred Hitchcock's "Psycho," "Marnie" and "The Birds," Ray Harryhausen's "Mysterious Island" and Francois Truffaut's "Fahrenheit 451." The documentary was put up for a Peabody Nomination. It is rebroadcast around the world annually. Mr. Crawford followed that documentary with another focusing on epic-film composer Miklos Rozsa (Ben-Hur). In his home of Omaha, Mr. Crawford has worked miracles with his annual "Omaha Film Event." Beginning in 1992, Mr. Crawford has thrown grand film events rivaling the Hollywood premiere's of yesteryear. Complete with stars and luminaries, Crawford has screened some of the greatest films ever made the way they were meant to be shown: pristine prints on huge 70 by 75-foot screens. Mr. Crawford forged friendships with those he honored and documented. As a teenager, Crawford wrote Bernard Herrmann a fan letter that had a little something extra to it. Mr. Herrmann telephoned the teen to discus his work. Mr. Crawford never met Bernard Herrmann in person, but they did correspond with each other. Though Bernard Herrmann died long before Crawford produced his excellent documentary, Crawford remains friends with Mr. Herrmann’s family. Excerpts of Crawford’s documentary may be heard on the Bernard Herrmann website. Mr. Crawford also became friends with Miklos Rozsa. Mr. Rozsa was ill and unfortunately died the week Crawford’s radio documentary aired nationally for the first time. 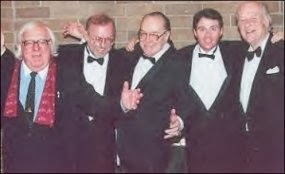 Bruce Crawford was also fortunate to forge a strong friendship with another boyhood idol: Ray Harryhausen. Mr. Crawford will be standing beside Ray Harryhausen in June when the master animator is honored with a Star on the Hollywood Walk of Fame. 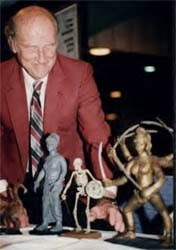 Mr. Crawford also shared a fact that will please Harryhausen fans world wide. Later this year, a coffee-table book covering Ray Harryhausen’s career will be released! The book is going to have hundreds of large color photos of Harryhausen’s magical creations. Bruce Crawford graciously agreed to sit for an interview. The interview below was conducted over a couple of weeks via phone and e-mail. RW: You first gained national recognition for your radio documentary "Bernard Herrmann: A Celebration of His Life and Music." How did this project come about, and why Herrmann? Bruce Crawford: It came about when I was wondering why there were no tributes to Herrmanns' music. I was introduced to his music when I saw MYSTERIOUS ISLAND as a child and just was bowled over by the music. It is this score that pushed me to do the work that I have done honoring films and the music to them. RW: You produced the documentary locally. When did NPR come on board? BC: We had the first broadcasts locally, but I wasn't satisfied with that. I contacted the people of WGBH in Boston and they took a listen and loved it and then broadcast it. I followed that with uplinking it on the NPR extended services network and made available to all the NPR stations nationwide. That took place in Nov. 1991. It has since been rebroadcast every year and now has been played in Europe as well. RW: Brian De Palma has been accused of being a Hitchcock plagiarist by many. It has been said that not only did he rip-off Hitchcock's style, but he also had Herrmann score his early films. Did Herrmann ever discuss his feelings about De Palma's work with you? BC: No, but his scores to SISTERS and OBSESSION are among his finest. Particularly OBSESSION, which I rank among the top 5 of his achievements. RW: How would you compare Herrmann's scores for De Palma's "Sisters" and "Obsession" with his Hitchcock scores? BC: I know there are purists who would not necessarily agree, but I feel OBSESSION is superior to VERTIGO upon which the film is loosely based on. Herrmanns' music is so profound as to be bordering on the spiritual. Deeply moving. RW: How did your Miklos Rozsa project come about? Was this before or after your "Ben-Hur" event in Omaha? BC: It came about because I feel Rozsa is the other "great" film composer that I admire most. The documentary also went into production during and after my BEN HUR event. RW: What about Rozsa's film work makes him "great" in your mind? BC: His unique ability to re create the sound of the ancient world. His Roman marches and his music of antiquity are second to none. His spiritual music of deep religious nature is profound. I call his score to BEN HUR the 20th.Century's answer to Handel's MESSIAH. RW: Are there any current film composers that you feel are in the same category as Herrmann or Rozsa? What do you think of Ennio Morricone? BC: I don't think there will ever be anyone to compare to Herrmann or Rozsa, but I do like much of Jerry Goldsmiths music, and feel he is the finest composer for films today. I like much of Morricone's work. I also admire Basil Poledouris's music to CONAN THE BARBARIAN, and Trevor Jones' THE DARK CRYSTAL and the scores to THE YEAR OF LIVING DANGEROUSLY and WITNESS by Maurice Jarre. John Williams music to CATCH ME IF YOU CAN is also a fine score from a recent movie. RW: I've seen many films that were ruined by terrible scores. Marvin Hamlisch's score for "The Swimmer" comes to mind as I just reviewed the new DVD. If you were going to produce a documentary about bad film scores who would you choose for a subject? BC: Boy that is a loaded question! There are a lot of bad scores today , I wouldn't even know where to start! 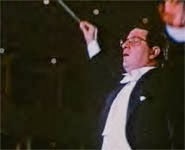 Herrmann once said that even music of a poor quality can help a film, because it is nearly impossible to stand to watch a film without some kind of music. RW: You and I have something in common in that we first noticed Bernard Herrmann's work while watching Ray Harryhausen's "Mysterious Island" as kids. I said in my DVD review that I could listen to that score alone. It is a majestic piece of work. Which of Herrmann's scores stand up best from a musical standpoint? Not just as an accent to the action on screen? BC: I agree that MYSTERIOUS ISLAND stands on it’s' own as pure music. As do many of his scores, FAHRENHEIT 451, and OBSESSION as well as HANGOVER SQUARES' Piano Concerto Macabre and many others stand as great music alone. RW: Your first "Omaha Film Event" was dedicated to Ray Harryhausen's films "Mysterious Island" and "Jason and the Argonauts." Was that when you first met Mr. Harryhausen? How did your friendship develop? BC: No I first met Ray over 20 years ago, and was corresponding with him even before that. We first wrote to one another and then I called him when he was in LA. 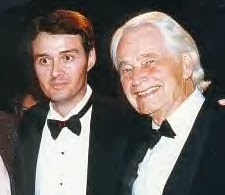 We kept in touch till we met in 1982 and in 1992 I honored him after his Oscar for lifetime achievement. We have been very close since then. I spent Christmas week with him in 2001 in London. RW: Do you think we will ever see another big screen film using the techniques Harryhausen perfected, or has CGI sounded the death kneel for stop-motion animation on a grand scale? BC: No, stop motion is hardly dead. JAMES AND THE GIANT PEACH and NIGHTMARE BEFORE CHRISTMAS were hit films that were exclusively stop motion. And CHICKEN RUN was also a stop motion film. I am sure there will be others. RW: How do you feel the work of Harryhausen and Willis O'Brien holds up in comparison with the CGI dinosaurs of today? It seems that Harryhausen would have been locked away for years to turn out something like "Jurassic Park." Is it feasible for someone to take up the gauntlet, now that Harryhausen retired? BC: I don't know. I think that the studios are obsessed with CGI and films that incorporate live action with CGI are now the rule. The "stop motion only" films like CHICKEN RUN I think will continue to be made. I think that the original KING KONG is unsurpassed. And the Harryhausen films are more popular than ever. I feel the creatures in MYSTERIOUS ISLAND for example look and move completely lifelike even by today’s standards. CGI couldn't make those creatures more life like. RW: I noticed on your web-site that you will be accompanying Ray Harryhausen in June to LA when he receives his Star on the Hollywood Walk of Fame. Why did it take so long for this tribute? BC: I can't speak to that other than an obvious oversight from years ago, but now it is happening and we can thank people like Arnold Kunert for that. RW: Who is Arnold Kunert? BC: Arnold is the man who spearheaded the letter writing campaign in 1992, to get Ray Harryhausen his lifetime achievement Oscar. He is also responsible for the campaign to get the star on the walk of fame for Ray. RW: Your "Omaha Film Events" have featured pristine prints of some of the greatest films ever produced in Hollywood. Where have you found the films? Have you been aided by AFI or any of the various foundations dedicated to film preservation? BC: No, I just did what I could to access the best prints possible, and after a few successes the studios knew of my reputation to some degree and have been very good about their prints to us. RW: Is the "Omaha Film Event" a for-profit event, or do you dedicate the proceeds to film causes? BC: All net proceeds go to various charities. RW: You are on the board of directors of the "Halfway to Hollywood" film festival in Kansas City. What is the focus of that festival? BC: Yes, I am on the Advisory Board to the film festival. I was a guest speaker in 2001 and now I will be hosting Ray Harryhausen in September with a showing of up to 5 of his films. The festival focuses on classics and foreign and other type of films. RW: What do you have scheduled for the next festival in Kansas? BC: They have the Harryhausen event for Sept. 12th. and I know Tom Savini is also scheduled. RW: Any favorite films you would recommend and why? BC: My favorites? Well of course MYSTERIOUS ISLAND and THE DAY THE EARTH STOOD STILL and also THE GHOST AND MRS.MUIR, which is also among the top of Herrmanns' achievements, if not the very top of his Romantic scores. And BEN HUR for me is the very top of my list of films. RW: How well do you know Forry Ackerman? Being about the same age, I imagine you grew up on "Famous Monsters of Filmland." How is his health? I've heard he is not well these days? BC: Yes, I have known Forry for several years and he was a special guest at my KING KONG salute with Ray Harryhausen and Ray Bradbury too. Famous Monsters kept my love of the Harryhausen films alive when I was a child in the late 60's and 70's. Forry is back in good health and I am told resuming his speaking schedule to his normal routine. RW: Anyone who visits your web-site will see just how elaborate your "Omaha Film Events" are. I noticed several faces and names in the coverage of each of the events. How big is the coalition that puts these events together? Do you receive civic support to promote the events? I imagine any city would be proud to have such an event occur. BC: No I have not received any civic support. The coalition is primarily several good friends and the co sponsorship that I acquire from various businesses like airlines, hotels, etc. RW: Have you thought of spreading the Events to other cities, or have others approached you for help in setting up similar events in other places? BC: Yes, in fact that is part of why I am working with the Halfway to Hollywood people. I have not pursued it in other cities too much, though I have been offered to do these in cities like Seattle and Salt Lake City and others. RW: What do you have planned (or hope to feature) at future "Omaha Film Event" series? 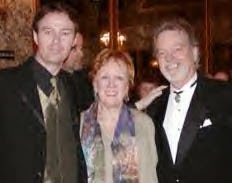 BC: I am working on a possible salute to SINGIN IN THE RAIN and also THE MISFTIS. It is always hard to tell what will come together or not. Sometimes none of the ideas come together and then something else out of the blue comes to me and it all falls into place. You just never know!